"Roachford" redirects here. For the album, see Roachford (album). Roachford released his first solo album, Heart of the Matter, in 2003. His next album Word of Mouth was released in June 2005 under the band name Roachford. In 2010, Roachford joined Mike + The Mechanics along with Tim Howar. The following year the album The Road was released featuring Roachford and Howar as lead vocalists, as well as the 2017 album "Let Me Fly". 1991 "Get Ready!" 22 — — 35 43 — — — — — Get Ready! + "Ain't No Stopping Us Now" by MOBO Allstars was a charity single released collectively by MOBO Award nominees in 1998, reaching No.47 in the UK Singles Chart. The artists featured on the recording were Another Level, Beverley Knight, Mica Paris, Damage, Nine Yards, Don-E, Hinda Hicks, Celetia, Dina Carroll, Dru Hill, Shola Ama, Truce, Misty Oldland, Ultimate Kaos, Kle'shay, Lynden David Hall, Kele Le Roc, East 17, Conner Reeves, Des'ree, Cleopatra, Glamma Kid, Honeyz, Kelle Bryan, Roachford, Byron Stingily, Alyson Brown, D'Influence, Michelle Gayle, Ignorants, Soundproof, Tony Dortie, David Grant and Carrie Grant. ^ Biography Roachford.co.uk. Retrieved 5 November 2009. Top 100 peaks, other than "Ain't No Stopping Us Now": "Official Charts > Roachford". The Official UK Charts Company. Retrieved 30 May 2017. N.B. This site displays 'compressed' chart peaks (exclusion rules applied) between positions 76−100. Top 200 peaks from November 1994 to December 2010: "Chart Log UK 1994–2010 > The Rabble Army – RZA". zobbel.de. Retrieved 30 May 2017. N.B. This site displays 'uncompressed' chart peaks (no exclusions applied) for positions 76–200, between November 1994 and May 2001. "Ain't No Stopping Us Now": "Official Charts > MOBO Allstars". The Official UK Charts Company. Retrieved 30 May 2017. ^ a b Roberts, David (2006). British Hit Singles & Albums (19th ed.). London: Guinness World Records Limited. p. 465. ISBN 1-904994-10-5. "Cuddly Toy": "The ARIA Report issue 223, week ending 22nd May, 1994: Chartifacts column". Imgur.com (original document published by ARIA). Retrieved 24 September 2015. Top 50 peaks: "australian-charts.com > Roachford in Australian Charts". Hung Medien. Retrieved 24 September 2015. Top 100 peaks from January 1990 to December 2010: Ryan, Gavin (2011). 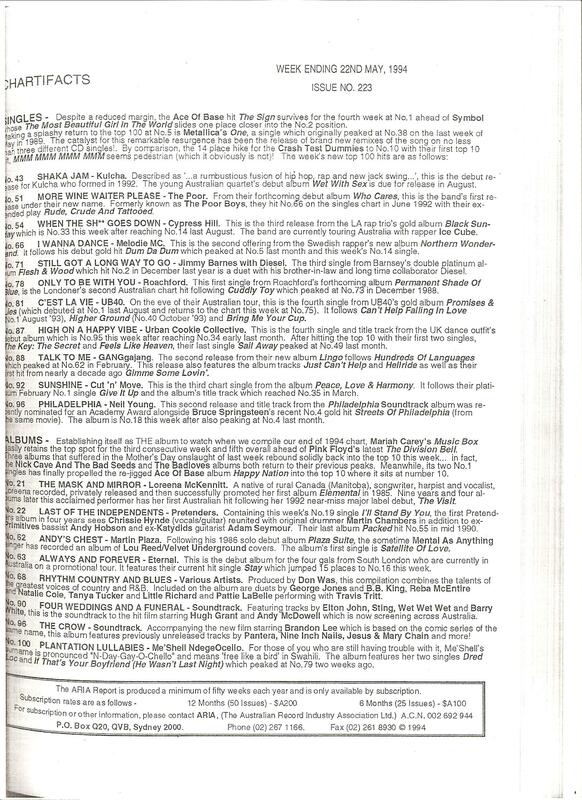 Australia's Music Charts 1988–2010 (pdf ed.). Mt. Martha, VIC, Australia: Moonlight Publishing. p. 237. 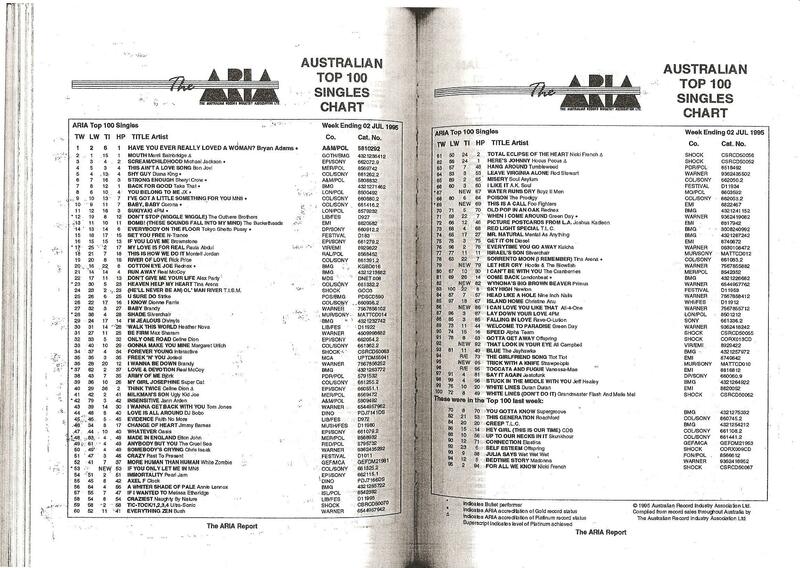 "This Generation": "The ARIA Australian Top 100 Singles Chart – Week Ending 2 Jul 1995". Imgur.com (original document published by ARIA). Retrieved 30 May 2017. N.B. The HP column displays the highest peak reached. All ARIA chart peaks to 26 October 2018: "Response from ARIA re: Roachford ARIA chart history, received 26 October 2018". Imgur.com. Retrieved 3 January 2019. N.B. The High Point number in the NAT column represents the release's peak on the national chart. ^ a b "austriancharts.at > Roachford in der Österreichischen Hitparade" (in German). Hung Medien. Retrieved 30 May 2017. Get Ready! : "Roachford – Get Ready! (album)" (in German). GfK Entertainment. Retrieved 30 May 2017. Permanent Shade of Blue: "Roachford – Permanent Shade of Blue (album)" (in German). GfK Entertainment. Retrieved 30 May 2017. Feel: "Roachford – Feel (album)" (in German). GfK Entertainment. Retrieved 30 May 2017. Word of Mouth: "Roachford – Word of Mouth (album)" (in German). GfK Entertainment. Retrieved 30 May 2017. ^ a b "charts.org.nz > Roachford in New Zealand Charts". Hung Medien. Retrieved 30 May 2017. ^ "swedishcharts.com > Roachford in Swedish Charts". Hung Medien. Retrieved 30 May 2017. ^ "hitparade.ch > Suche nach: Roachford (alben)" (in German). Hung Medien. Retrieved 30 May 2017. ^ "Billboard > Roachford > Chart History > Billboard 200". Billboard. Retrieved 3 January 2019. ^ "lescharts.com > Roachford dans les Charts Français" (in French). Hung Medien. Retrieved 30 May 2017. "Cuddly Toy": "Roachford – Cuddly Toy (single)" (in German). GfK Entertainment. Retrieved 30 May 2017. "Get Ready! ": "Roachford – Get Ready! (single)" (in German). GfK Entertainment. Retrieved 30 May 2017. "Only to Be with You": "Roachford – Only to Be with You (single)" (in German). GfK Entertainment. Retrieved 30 May 2017. "Lay Your Love on Me": "Roachford – Lay Your Love on Me (single)" (in German). GfK Entertainment. Retrieved 30 May 2017. "This Generation": "Roachford – This Generation (single)" (in German). GfK Entertainment. Retrieved 30 May 2017. "The Way I Feel": "Roachford – The Way I Feel (single)" (in German). GfK Entertainment. Retrieved 30 May 2017. "Pop Muzak": "Mousse T. with Roachford – Pop Muzak (single)" (in German). GfK Entertainment. Retrieved 30 May 2017. 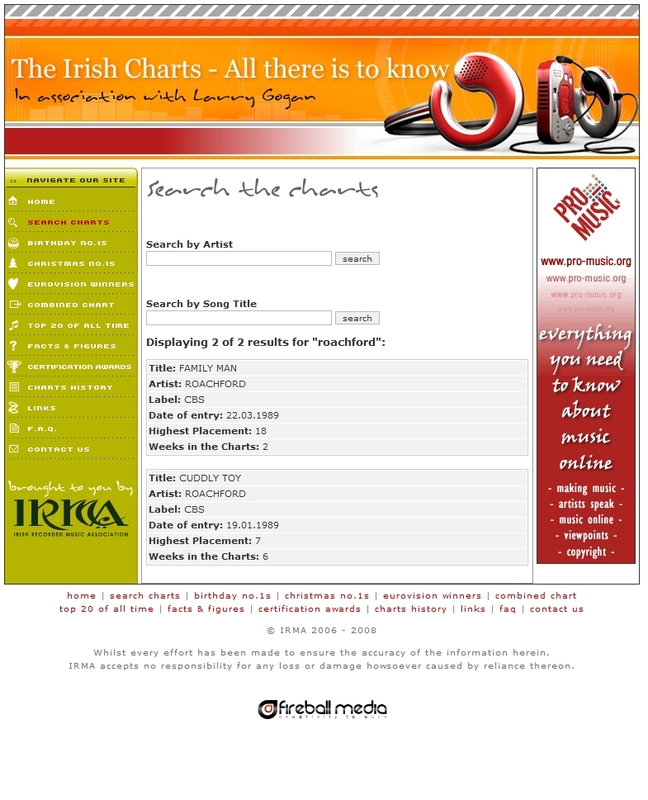 ^ "The Irish Charts – All there is to know > Search results for Roachford (from irishcharts.ie)". Imgur.com (original source published by Fireball Media). Retrieved 30 May 2017. ^ "dutchcharts.nl > Roachford in Dutch Charts" (in Dutch). Hung Medien. Retrieved 30 May 2017. ^ "hitparade.ch > Suche nach: Roachford (songs)" (in German). Hung Medien. Retrieved 30 May 2017. ^ "Billboard > Roachford > Chart History > The Hot 100". Billboard. Retrieved 3 January 2019. "Silent Running (On Dangerous Ground)"
"All I Need Is a Miracle"
This page was last edited on 21 March 2019, at 14:39 (UTC).